Antibody was affinity purified using an epitope specific to TIF1 Alpha/TRIM24 immobilized on solid support.The epitope recognized by A300-815A maps to a region between residue 700 and 750 of human Transcriptional Intermediary Factor 1 Alpha (Tripartite Motif-Containing 24 ) using the numbering given in entry NP_056989.2 (GeneID 8805).Immunoglobulin concentration was determined by extinction coefficient: absorbance at 280 nm of 1.4 equals 1.0 mg of IgG. 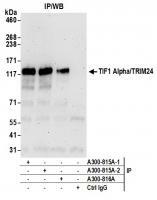 Detection of human and mouse TIF1 Alpha/TRIM24 by western blot. Samples: Whole cell lysate (50 µg) from HeLa, HEK293T, Jurkat, mouse TCMK-1, and mouse NIH 3T3 cells prepared using NETN lysis buffer. 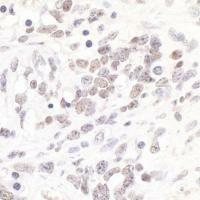 Antibody: Affinity purified rabbit anti-TIF1 Alpha/TRIM24 antibody A300-815A (lot A300-815A-2) used for WB at 0.1 µg/ml. Detection: Chemiluminescence with an exposure time of 30 seconds. 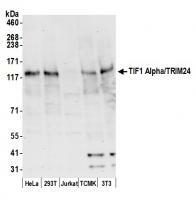 Detection of human TIF1 Alpha/TRIM24 by western blot of immunoprecipitates. Samples: Whole cell lysate (0.5 or 1.0 mg per IP reaction; 20% of IP loaded) from HeLa cells prepared using NETN lysis buffer. 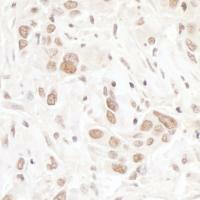 Antibodies: Affinity purified rabbit anti-TIF1 Alpha/TRIM24 antibody A300-815A (lot A300-815A-2) used for IP at 6 µg per reaction. TIF1 Alpha/TRIM24 was also immunoprecipitated by a previous lot of this antibody (lot A300-815A-1) and rabbit anti-TIF1 Alpha/TRIM24 antibody A300-816A For blotting immunoprecipitated TIF1 Alpha/TRIM24, A300-815A was used at 1 µg/ml. Detection: Chemiluminescence with an exposure time of 3 minutes. Localization of TIF1 Alpha/TRIM24 Binding Sites by ChIP-sequencing.Chromatin from Breast cancer cell line T47D was immunoprecipitated with anti-TIF1 Alpha/TRIM24 antibody A300-815A and analyzed by DNA sequencing. The figure illustrates the peak distribution of TIF1 Alpha/TRIM24 binding within a 250 Kb region of chromosome 19 as detected using anti-TIF1 Alpha/TRIM24 antibody A300-815A. ChIP-seq validation performed by Active Motif, Carlsbad, CA.